#1: The Check Engine light is on. If something is wrong somewhere in your exhaust system, your check engine light might turn on. However, this isn’t true all of the time, so you need to be aware of the other signs as well. #2: Unpleasant exhaust odors inside your car. The exhaust system runs under the entirety of your car – it doesn’t just consist of the muffler and tailpipe. If there’s a leak in the system, you’ll notice exhaust odors inside your car while you’re driving it. They will be more noticeable during short trips, and when you’re idling in a parking lot or at a red light. #3: Increased noise coming from both the engine and the exhaust system. Since exhaust systems are large and consist of many different pipes, a broken one can vibrate and create loud noises while your car is running. You may also notice loud muffler noises. Your engine will also make rumbling noises if there’s a leak in your exhaust system. This is a sign that air is getting in from somewhere. #4: Decreased fuel efficiency of your vehicle. The exhaust system works with the engine to regulate the fuel used by your car. A leak in the system may cause the engine run hotter and to draw more fuel, thereby decreasing your fuel efficiency. Thankfully, once the leak is repaired, everything will return to normal. #5: Unfamiliar vibrations while driving. The steering wheel, gas pedal, or in some cases, the entire car, may vibrate strangely when your exhaust system is leaking. This is caused by your engine’s need to overcompensate for the problem. 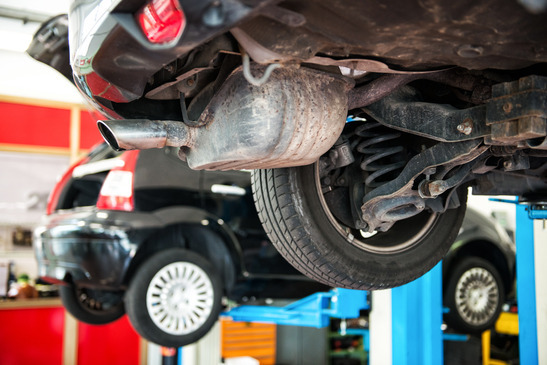 All of these can be signs the exhaust system on your car has an issue – it could anything from a small leak to a rusted out muffler. If your car is experiencing any of the symptoms listed above, we can help you. Contact or visit Park Muffler today!